Riyadh, 8 May 2018: Under the Patronage of the Custodian of the Two Holy Mosques, King Salman bin Abdulaziz Al-Saud, and the leadership of HRH Prince Mohammed bin Salman bin Abdulaziz, the Crown Prince, Deputy Prime Minister, Chairman of the Council of Economic and Development Affairs and Chairman of the Public Investment Fund (PIF), PIF has announced the second Future Investment Initiative (FII), which will take place from October 23rd to 25th in Riyadh, Saudi Arabia. Advancing Human Potential – looking at a world where humans and machines work together to create safer, more productive and happier lives. FII was launched as a substantial international platform for expert-led debate between investors, innovators and governments as well as economic leaders. The inaugural event in 2017 saw over 3,800 participants from more than 90 countries, join in the discussions and debates to explore future developments in the world economy, including investment trends around areas such as energy, infrastructure, Artificial Intelligence and robotics as well as new growth areas. The second edition aims to continue building active, global networks of influential actors to further explore the emerging industries that will shape the global economy and investment environment over the coming decades. 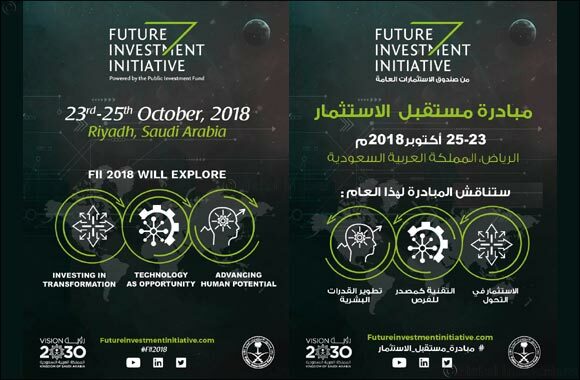 Last year’s FII saw the launch of the Public Investment Fund Program (2018-2020), one of twelve Vision 2030 Vision Realization Programs, which will act as a roadmap to help drive the economic diversification in the Kingdom and transform Saudi Arabia into a global investment powerhouse. In addition, an expo featuring cutting edge technology also showcased Saudi Arabia’s future Giga Projects, a key element of the Kingdom’s Vision 2030 economic program. The expo opened following the launch of NEOM by HRH Prince Mohammad bin Salman Al-Saud, Crown Prince, Deputy Prime Minister, Chairman of the Council of Economic and Development Affairs and of PIF. Launched to promote global collaboration, FII has already fostered new partnerships that will help transform industries in Saudi Arabia and globally. The 2017 edition saw future initiatives announced with Blackstone, SoftBank, Virgin Galactic, The Spaceship Company and Virgin Orbit. The Future Investment Initiative is being organized in the context of Saudi Arabia’s Vision 2030, the ambitious blueprint that is already charting the path for the Kingdom to harness its strong investment capabilities and use its unique strategic location to become a global investment hub connecting three continents. Further updates on the 2018 program, partners and speakers will be announced over the coming months.